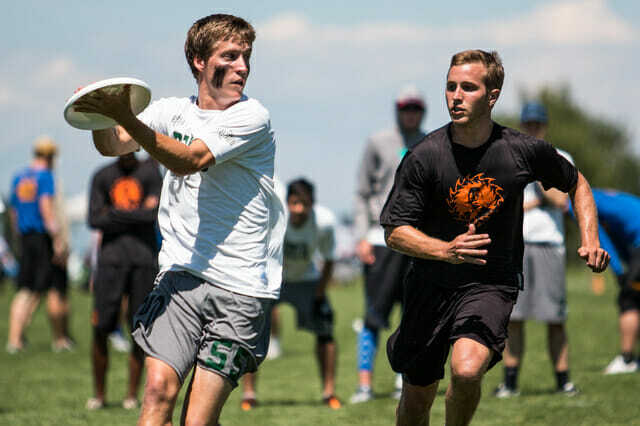 This article was written by guest author Bryce Merrill, coach of Utah Elevate. Part one of this article can be found here. While we might draw an upline cut as a straight line 45 degrees to the thrower when we’re diagramming the play on the whiteboard, there are actually multiple points of attack on viable upline cuts. Good cutters don’t fake. And good handler don’t either. They’re just willing to beat you at a number of locations of their choosing. Your initial position can sometimes be enough for you to be open. Is your defender aggressively poached into the upline lane? Perhaps they’re face-guarding or pressed and anticipating your upline? This spot’s for you! Less is more on the around.For the Elevate women’s club team, we pushed our upline reset handler 5-10 yards downfield from the handler. If, when activated, there was space to the around (or even IO break space), we’d allow the thrower a second to put a disc out the space. The cutter would never turn and run back towards this space, unless the disc was thrown. Sometimes, with hips turned towards the disc, a little side shuffle was enough to get the defender to look or turn their hips towards the backfield. The rest of the upline space is now yours. Feast! Upline cuts are less about top speed and more about acceleration. Using the skinny or dishy spot (with the handler now moving upline but perhaps still barely to the IO break of the mark) can exploit this acceleration and allow you to complete the pass when the cutter is open. Throwing this upline, while often a smaller gain/separation from the defender, is less susceptible to poaches from the stack common with deeper, longer strikes. If your get first step separation, have the handler hit a slight OI to your inside hip. Or, if your initial step was vertical, have them hit a deeper OI past the defender where they won’t likely be able to triangulate and make a play on the disc. Finally, use the traditional upline space out in front (or even to the open side) of the thrower. If you’re accelerating past your defender, identify if you can seal them under or over you. Close the space between you and your defender, land a strong ‘stick’ step and burst towards separation. Going steeper on the cut can be lucrative—gaining big yards in a power position can provide some viable scoring opportunities. But be wary of poach defenders that are baiting these deep strikes. Throwers need to be able to communicate, watch their upline cutters, and read the remaining defenders on the field to avoid these costly turnovers. Having worked with a number of high school and college players the last decade, I’m compelled to urge caution in implementing this next paragraph. But if you’re looking to snag an eventual STF All-Star nod or ensure that your college is included in Ultiworld’s 2019’s Top 11 branding listicle, then adding some variation to your upline cuts can pay big dividends and ensure you don’t become predictable in your reset system. Read the defense and take advantage when they overplay the momentum of a good upline cut. Be sure to communicate with your thrower, and remember that you’ve got teammates ready to fill the space behind you in most reset systems—use sparingly. Once you’ve reached full speed downfield, land a stick step and reverse course. Typically, you’ll head back the exact direction that you came from (known as railroad cuts out here in Utah) or flat towards the breakside (the seven-cut). Seal your defender out and burst towards your new cut. A quick swim move and seal cut can create some big separation and an easy target for your handler to loft a throw towards. If you have a great first two to three steps, your defender is going to have to stop shuffling and commit to a full sprint to keep up with you. Once your defender has committed their hips, stop your upline cut with a strong ‘stick step’ and allow your thrower to hit a quick dishy. This cut, while closely resembling a change of direction cut, doesn’t require the handler to run towards a new space. Instead, simply stopping the cut and allowing a quick short break throw is enough to create separation. While changing direction or stopping mid upline cut, handlers can either pivot towards their thrower with the inside shoulder or perform a back shoulder cut. Perhaps your team identifies these as clockwise and counterclockwise or with other terminology. But how and why are these pivots effective? Inverted pivots allow constant eye contact and easier communication with the thrower. And they’re quick to perform. With your outside foot forward on your upline cut, use a strong stick step to immediately stop your forward momentum. Swing your inside shoulder and face your hips, feet, and shoulders towards the thrower with enough space to the inside lane of the mark. Extend your IO hand out and, without turning backfield, wait for a quick lefty backhand or scoober to immediately hit you in the IO lane. Back shoulder cuts work great because they seal the defender out to the open side and create bigger separation. While there is a temporary loss of eye contact with the thrower, you can quickly establish a new line and they can lead you out to space. With your inside foot forward, perform a strong stick step. Drop over your inside shoulder and, with your back now to your thrower, begin your cut towards the break space. Both the inverted and back shoulder pivot can be performed at each upline location. Experiment to see what works for you and your team. Finally, each pivot should be paired with a cut that can take you back to the upline cut. For example, if you perform a stop cut in the IO lane and you can get your defender to turn their head back towards the thrower while they commit their hips to lunge for a lefty backhand, you’ve left your hips lateral and are able to burst back to your initial upline cut and finish the play. Similarly, a backshoulder ‘railroad’ cut performed in the IO space can be reversed after a single step as you double back towards the upline cut. Finally, you can pair an inverted pivot with a back-shoulder pivot on one of these double cuts to really sell the fake. After an inverted pivot ‘stop’ in the IO lane, allow the defender to slide under and put pressure on that IO lane. As they slide under, drop over your back shoulder for a full 360 spin move and immortalize yourself in highlight reels. Work on pairing your razzle-dazzle with both a back-field and upline portion to really put your defender on skates. The advantages of receiving the disc on a successful upline cuts are numerous. You’ll get power positions, you’ll change the angle of attack for your team, and you’ll score goals at the open-side cone. But the off-disc benefits of a strong upline game can be just as beneficial over the course of a game or season. Similar to the offensive influence of a basketball player like Giannis Antetokounmpo, a constantly aggressive upline attack creates a new center-of-gravity on the field. Marks feel more pressure to assist the upline cut. Poaches can be drawn out from the stack. Even the front of the stack’s defender can feel the need to prevent this dangerous cut. Even the presence of these cuts, without accompanying throws, can draw the defense’s attention and allow for other areas—like the breakside hammer space, a quick around thrown against a flat mark, etc.—to be leveraged easier. Good teams will need to notice a defense’s adjustment before they throw away a poach turn or jam the open side of the field. An elite handler group can require a lot of work individually and as a unit—how can you implement and evaluate success with your team? While spin moves and dosie-does can break ankles, fundamental footwork is what provides the groundwork for systematic excellence. Being able to cut and create separation laterally, having the power to bound and land explosive stick-steps, and stopping and changing direction on a single step are far more important than overly complicated pivots and fake sequences. Spend the time watching footage, implementing a lifting regiment that powers these sequences, and getting your 10,000 reps before you worry about the rest of the razzle-dazzle. Rep your timing and communication with the thrower. 2v2 drills that emphasize different components can facilitate and further the conversation between thrower and cutter. Prioritize cutter or handler-initiated cuts and space. Establish calls for reminding handlers to ‘hurry up and wait’ in the preferred starting position. Introduce a third handler for 3v3 that encourages teammates to play off of your momentum and cuts so the unit works together. Identify where your team likes to attack and with which pivots and moves. Establish priorities for the redzone, the trap side, or with a particular player. Perhaps your team values a higher quantity of upline cuts within a stall that requires you to vacate the upline space quickly. Whatever it is, get on board with your team’s priorities! There’s no wrong way to cut upline. If your thrower has space to throw towards while you create separation from your defender, it’s a viable cut. Take some of these principles and add them to your open side reset, your front of stack fill cut, or any other ISO cut. Play some mini and goaltimate and learn how your thrower’s abilities make new and different upline cuts viable. Comments on "Tuesday Tips: Getting Open Up The Line [Pt. 2], Presented By Spin Ultimate"